SCVHistory.com LW3192 | Film Clip: St. Francis Dam Hero Thornton Edwards in 'The Grapes of Wrath,' 1940 (Speaking Part). Thornton Edwards in "The Grapes of Wrath"
Motorcycle officer Thornton Edwards portrays — what else? 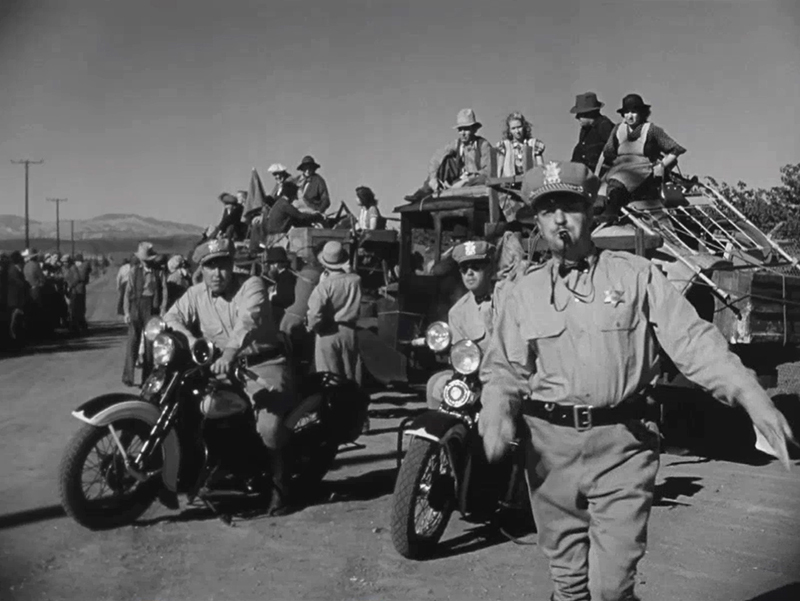 — a motorcycle officer in John Ford's 1940 film adaptation of John Steinbeck's classic "The Grapes of Wrath." 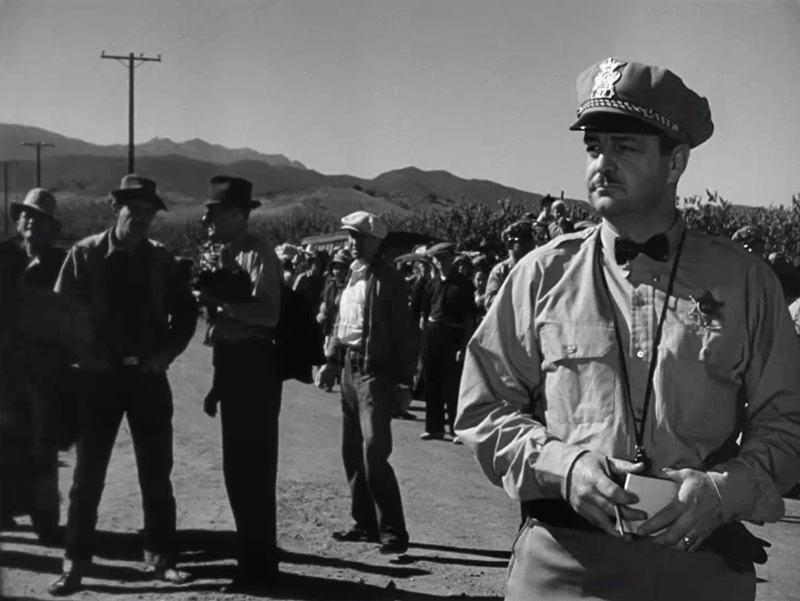 In his big scene, we hear Edwards blow his whistle and talk to Tom Joad (Henry Fonda). This scene was filmed at the intersection of N. Moorpark Road and E. Janss Road in Thousand Oaks (thanks to viewer Michael Ragan for that information). Thornton Edwards (born July 15, 1894, in Maine) came to Hollywood and appeared in about two dozen short features from 1916 to 1921 before leaving the business to become a motor officer in the San Fernando Valley. He ended up in Santa Paula where he joined the police department in the mid-1920s and then became a state motor patrolman (precursor to the California Highway Patrol, which formed in 1929). Far away in Saugus, at three minutes before midnight March 12, 1928, the St. Francis Dam collapsed, sending a wall of water down San Francisquito Canyon. The floodwaters hit the Santa Clara River and turned west, taking aim at the little towns that stood along the route to the Pacific Ocean — including Santa Paula. At 1:30 a.m. on the 13th, a Pacific Long Distance telephone operator called Santa Paula's night operator, Louise Gipe, and warned her of the coming flood. Gipe alerted Thornton Edwards, who hopped on his Indian motorbike and rode door to door, telling residents to get to higher ground. Actually he made double time by riding to every other door, telling people to warn their next-door neighbors. The floodwaters hit Santa Paula at 3 a.m. Many more people might have perished if not for Thornton Edwards' wild ride. Edwards left state duty to become Santa Paula's police chief, but the love affair was not to last. Some say his moment of heroism was drowned out in booze; whatever the case, by the end of the 1930s he'd been fired. Edwards returned to Hollywood in 1939 played minor characters in some 30 low-budget (B) movies, including a few Gene Autry and Johnny Mack Brown vehicles, before retiring from the screen in 1949. Most roles were uncredited; several called for a contrived Latin accent, and when he was credited, sometimes it was as Joaquin Edwards. 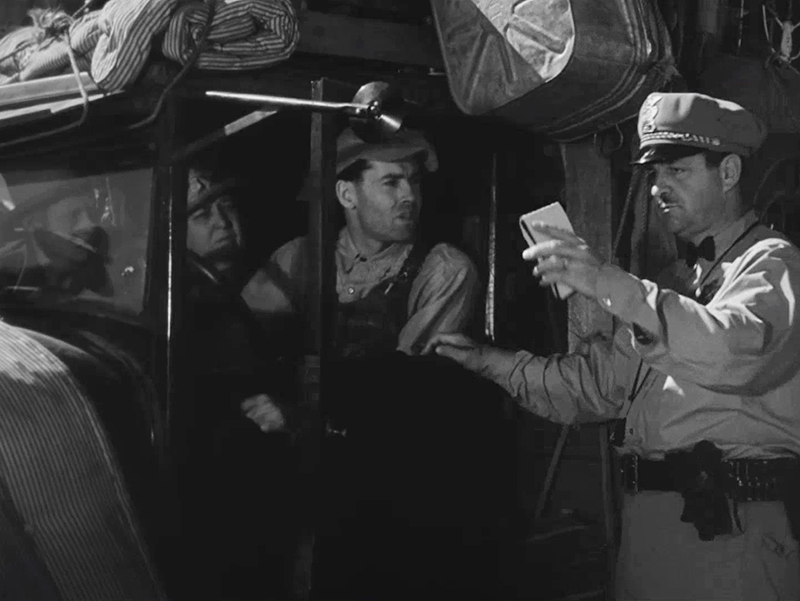 He did appear briefly (as an uncredited motor cop) in at least one big picture: John Ford's "The Grapes of Wrath" (1940) with Henry Fonda. Edwards would live out his days — another four decades — in Tulare, Calif., where he died at age 93 on Feb. 1, 1988. Further reading: Thornton Edwards, Hero of the St. Francis Dam Disaster.